The shimmering pink hues combine with subtle neutral mattes and warm shades to achieve the delicate romantic look for your wedding day. 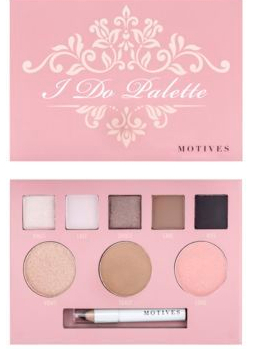 Look to this Motives palette to complete your appeal as a blushing bride this season. It includes five shades of pressed eyeshadow in matte and shimmer finishes, with colors ranging from light pink to rose gold, brown and black; one pink blush; one bronzer; one iridescent gold highlighter infused with pink undertones; and one brown mini eye pencil.